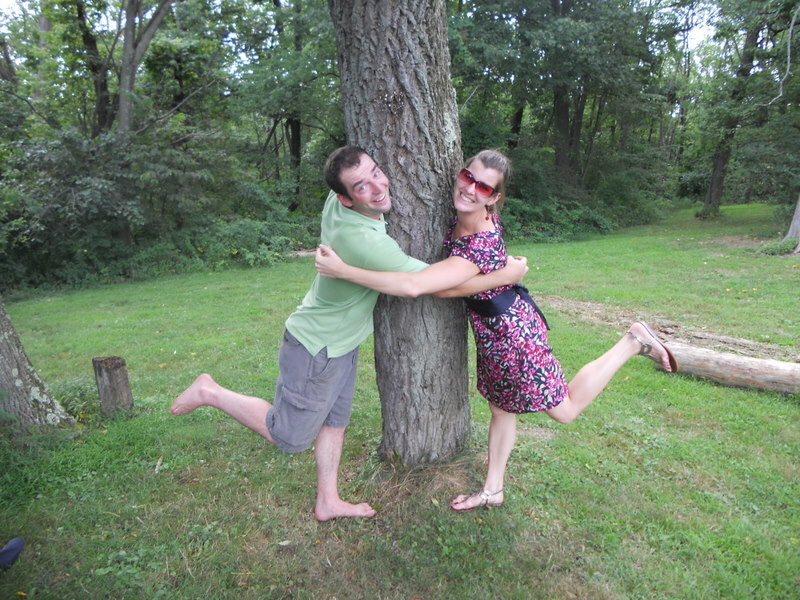 The most popular post on HitchDied is Ben’s proposal story, and I feel terrible about that. Don’t get me wrong, I love Ben, I love how he proposed, and I love love love his post about it. [And I love the new traffic it brings to my blog.] But my blog is now part of the problem: the post is so popular because people are searching the internets for creative and epic proposal ideas because they think nothing less will do. So today I offer a counterpoint from a fellow member of Team No Story. Leslie works with Collin, but she actually got to know me through reading my blog, and in the few months since we’ve met she’s made it abundantly clear that she is smart, kind, fun, and bone-deep awesome. Hopefully her brilliant words about her non-dramatic, non-clever, completely romantic proposal will help convince you that You Don’t Need a Proposal Story, you just need love. I am incredibly proud of my engagement story, though I’m finding that I feel compelled to justify why it was so perfect for us. I have learned that an incredible pressure is put on men to come up with a creative and dramatic proposal plan. As if it won’t be “good enough” if it isn’t movie quality. If my proposal had been filmed, that single scene would tank the movie. I hope to convince you, however, that it was precious, special and perfect for us. In retrospect, I might have been disappointed if it had happened any other way. Early this year, Steve and I started talking about getting engaged. I had only recently moved to Pittsburgh, so we were living in the same city for the first time since we started dating. I knew for a fact that I wanted to marry Steve, but I wanted to make sure we had the skills and commitment to deal with unavoidable conflicts (I’ll spare the details of my parents’ horrible marriage, but the take home message is that conflict resolution skills are really important to me). Steve was patient and wonderful and even agreed to go to couples therapy with me. We talked a lot about getting engaged and we grew a lot as a couple. In the meantime, he came up with a plan for how he would ask me to marry him and also a secret ring-buying strategy. Unfortunately, both of these plans fell through. Steve had planned to propose sometime during my birthday weekend when we would be vacationing in Maine, the state I fell in love with while attending college there. It got canceled for work reasons. I ruined his second plan by announcing that I didn’t like any of the rings in the 3 stores we went to on a single day. How could I be so picky and why does it matter so much!? How on earth could he surprise me with a custom ring I’d like if I don’t like any of a million options? [In fairness, these were stores in the mall, so the selection was limited and incredibly redundant between stores.] He told me about both of his now-ruined plans and how disappointed he was that they fell through. While I understood his disappointment, I was impressed and excited that he had made elaborate plans. I was confident that he would make new equally creative and thoughtful plans. After the ring-shopping episode, however, Steve decided to involve me in every step of the ring selection process. He let go of his desire to surprise me, and embraced the idea of getting me something that is perfect for me (insert guilt here—how could I not love this man!). The result of this, however, is that the fun of the surprise was gone for him, so instead of leaving me out of it once everything was ordered, he wanted to share every step of the engagement process with me. I knew when the estimated completion date was, when they called to tell him it was done, and when he picked it up. While there was a part of me that was disappointed by the complete lack of surprise, this made me feel free to discuss how I felt about the idea of marrying Steve. During the weeks before our engagement, we had some of the most important and wonderful discussions about our relationship and I had zero reservations about committing to marry him. …until a week passed and Steve had not proposed. The weekend came and we had a really nice Saturday: we went running, to a garage sale, to a fancier lunch than normal and then we watched movies on the couch all afternoon. Unfortunately, the whole day felt awkward because we both thought that this was supposed to be the day that Steve would propose. I couldn’t help but think: Is he not sure he wants to ask me? Is he having second thoughts? Is he really ready to commit to this? He’s got the freakin’ ring! It’s been in this house over a week! What is he waiting for!? I finally broke down and asked him what was wrong—why was he hesitating? He seemed relieved that I finally brought it up. We talked about his disappointment with how nothing happened the way he planned and he was having a hard time coming up with a second plan that was “good enough.” He wanted to talk about the very big commitment he was about to make (of COURSE he does! It’s a huge decision!). He wanted to know about my expectations for the proposal. Instantly, my desire for an elaborate proposal story evaporated. I really don’t give two shits how this thoughtful, wonderful and brilliant man proposes. I will say yes—unless he pays to have the words “Will you marry me?” written by the exhaust of a plane while we’re at a ballpark. And then I got to thinking. Steve is as anti-bandwagon as it gets. There isn’t a dramatic bone in his body. Steve NEVER shows off. He doesn’t perform on command. His mind empties of good ideas if you put him on the spot, but he will get up at 6am to go get me flowers for no reason at all on some random Saturday. He is clever and creative in weird and wonderful ways. I LOVE this about him. It’s almost as if his plans were fated to fall through—it wasn’t supposed to happen that way. We’re not that kind of couple! During our conversation on that Saturday, Steve said: “You know, this is your fault. You make me talk about everything and now I need to talk about this.” The truth is, I want to be the person he processes things with. So when he proposed on a random Wednesday night, right after we had resolved an argument quickly and painlessly, it just felt right. Steve felt that the argument and resolution were symbolic—of the progress we’ve made and the commitment we both have to making our relationship work. He told me how much he loves me and why he thinks we’ll be able to solve the inevitable challenges that come with a life together. The fact that he considered this moment to be symbolic meant more to me than I can express. This guy is right for me. My engagement didn’t happen the way I expected or the way I imagined it would be all my life. I was excited by the prospect of being surprised and blown away by how clever and thoughtful my boyfriend would be. However, I’m really glad his original plans fell through because it doesn’t suit Steve to be scripted and dramatic and if it did, I probably wouldn’t love him as much. Because of our mutual need to process things with each other, we ended up with a proposal story that is very much like our relationship: genuine, purposeful and simple. I wouldn’t have it any other way. We bought a ring together a few weeks later and went out to dinner where he officially asked me (the ring hadn’t come in yet but we were tired of waiting – he made me a wire ring instead). Now I don’t know why we even bothered with that, we could have told people after the first day, I just felt pressure for a story I guess. Everything was initiated by me and nothing was a surprise. I absolutely did not care about the proposal deep down, I really just wanted to be married. The only people disappointed in this story are the ones who have their own proposal baggage. Aaaaand your non-story made me cry anyway, with the sweetness and love of it all. I love our own non-story-story (spoiler: I was sunburned, sweaty, snot-filled, and a bit unpleasant), but surprise or no surprise, I love, love, love the fact that you got to hold hands and think about it, and then sally forth as an engaged, unstoppable, kickass team (lathered in awesomeness). Sigh. A little bit “we started this thing as a team, and we’ll be old and grey to finish it as a team” is a pretty good story all by itself, I think. Yay! Love is rad. In all its incarnations. This made me cry! My wedding didn’t happen the way I imagined it would (we eloped), but it ended up being perfect for us. So I can appreciate that feeling. Congratulations to you both! It sounds like you already have a wonderful foundation to build on. I just want a “yay!” button to push. No comments, just yay Leslie and Steve, and yay Team No-Story (which always ends up being a very complicated story, to explain the fact that yes, you just decided to get married after making out in your car at your parents’ house, because it was the day after Thanksgiving and one of you has bronchitis and you both love each other). I would like to EXACTLY! your YAY! Also this was some really good writing. We picked a ring on eBay. I haggled for it. We bought it. He took me to our local Renaissance Festival where we always have a blast. He got down on one knee, asked me. I said yes. We went to eat and watched the joust. End of story, but perfect for us. You and Steve are pretty awesome. Also, your story is super cuun.